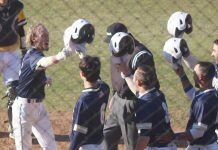 McCook will strive to continue the Rams' winning traditions and capture another Mountain East Conference Championship in the 2018 season, just as the Rams did last season by defeating Charleston on Senior Day. (Jason Fischetti/The Picket). 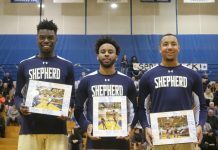 The Rams (9-0, 9-0 MEC) did not play a complete game, but made several key plays in the second half to come away with a 49-12 win on Senior Day in Shepherdstown, W.Va., against the University of Charleston Golden Eagles (3-6, 3-6 MEC). With the win, the Rams have now clinched the outright Mountain East Conference Championship, and third straight overall. On their second drive, the Rams got on the scoreboard first, as senior quarterback Connor Jessop (25/39, 317 yards, 4 TD, 2 INT) found sophomore tight end DJ Cornish (3 receptions, 44 yards, 1 TD) on a beautiful play-action pass for a 34-yard touchdown strike to put the Rams up 7-0 with nine minutes left in the first quarter. 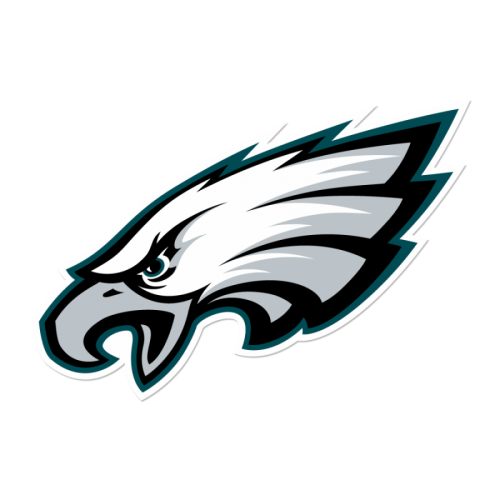 Needing an answer, on the next drive, backup quarterback Daniel Itza (5/13, 50 yards, 1 INT, 14 carries, 124 yards, 1 TD), a senior, gave the Golden Eagles life with his 71-yard burst right through the heart of the Rams’ defense on a third-down and seven from the Golden Eagles’ own 29 yard line. The extra point was missed by junior kicker/punter Dylan Miles, but the Golden Eagles were only down 7-6 with 8:54 to play in the first quarter, as they now believe they could play with the Rams. Sophomore tight end DJ Cornish got the Rams on the scoreboard first with his 34-yard touchdown reception. (Tatum King/The Picket). The Rams would not get their next score until the 9:26 mark in the second quarter, when Jessop threw an excellent pass to junior wide receiver Wanya Allen (8 receptions, 104 yards, 1 TD). Allen displayed great focus on the play, as it looked like he was close to the ground but kept his body from touching the ground and sprinted the final eight yards or so into the end zone to give the Rams a 14-6 lead. A few defenders around Allen stopped chasing him because they thought the play was over and he was down, but they sadly learned that was not the case. Throughout the rest of the first half, the Rams’ offense really struggled finding any kind of traction, especially when they were given great field position. On the Golden Eagles’ next possession, Itza’s pass was batted up in the air near the line of scrimmage, allowing time for senior defensive end Elijah Norris (4 tackles, 0.5 tackles for loss) to get under the pass and intercept it. Senior defensive end Elijah Norris celebrating with a coach after his interception. (Jason Fischetti/The Picket). The Rams had the ball at the Golden Eagles’ 23 yard line, but on third down, Jessop forced a throw that was intercepted by the Golden Eagles’ Jonte Pooler (3 tackles), a redshirt-junior, at his own two yard line. A kicking catch interference penalty on the Golden Eagles’ following possession set up the Rams with great field position again, this time at the Golden Eagles’ 22 yard line. Then, for the second play in a row, Jessop’s pass was intercepted, this time by Luke Sears (5 tackles, 1 pass break up), a senior linebacker. This killed the Rams’ momentum, allowing the Golden Eagles to continue to hang around in the process. 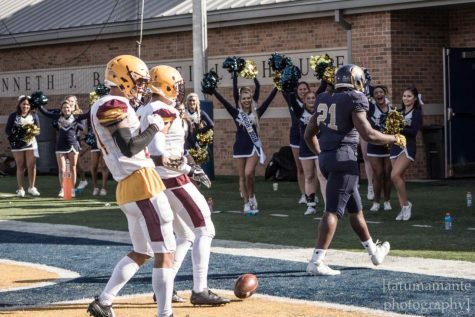 The Golden Eagles finally took advantage this time on their next possession, as redshirt-junior quarterback Colar Kuhns ran in for a one-yard touchdown run with three seconds remaining in the first half, trimming the deficit to 14-12. Kuhns’ throw to the back of the end zone was incomplete on the two-point conversion attempt, but the Golden Eagles sent a message to the Rams that they came to play. Kuhns came into the game for Itza, who sat out for a while after getting a shoulder stinger just a few plays earlier in the drive. At halftime, the Golden Eagles were filled with so much hope against the highly-touted Rams, but that hope would soon fade. 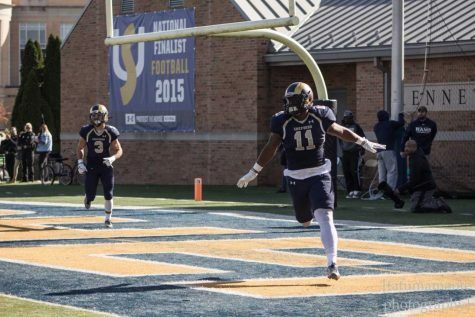 The Rams’ Dontae Mauck, a sophomore wide receiver, forced a fumbled on the opening kickoff of the second half, as the Golden Eagles’ returner Kane Rousch, a redshirt-sophomore running back, could not hang onto the football. This got the crowd back into the game and gave the Rams another chance to cash in on a short field. Senior running back Jabre Lolley (18 carries, 108 yards, 1 TD, 1 reception, 16 yards, 1 TD) scored on a wheel route out of the backfield for a 16-yard touchdown reception that augmented the Rams’ lead to 21-12 just over one minute into the second half at the 13:47 mark. In the first half, the Rams struggled greatly to run the football, as the Golden Eagles got substantial penetration into the Rams’ backfield. However, the second half would prove to be an entirely different story, as the Rams’ run game came alive. Jessop scrambled his way to a 35-yard touchdown a little over midway through the third quarter that gave the Rams more breathing room with a 28-12 lead. 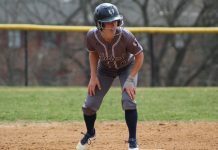 As he has demonstrated all season long, Jessop’s running ability is just another added dimension to an offense that already has plenty of ways to score. Lolley finished the game with 108 yards, but got over half of that total on a 56-yard touchdown run. On the play, Lolley showed impressive burst and stamina, as the field parted like the red sea. The Rams were in complete control, as they now led 35-12 with 1:49 to play in the third quarter. Senior running back Jabre Lolley celebrating after his 56-yard touchdown run. (Tatum King/The Picket). Itza played courageously and battled hard, but once the Rams’ defense found a way to shut down the run game and made the Golden Eagles one-dimensional, Itza and the rest of the Golden Eagles’ offense had no chance. They were never really able to mount a successful, productive drive in the second half, as the Rams’ defense showed why they are so highly-feared by the rest of the MEC. With a little under four minutes remaining, on a trick play, Jessop rolled to his right, stopped, and through a lateral to senior offensive linemen Lavonte Hights, who followed his blockers into the end zone for a touchdown that put icing on the cake for the Rams. 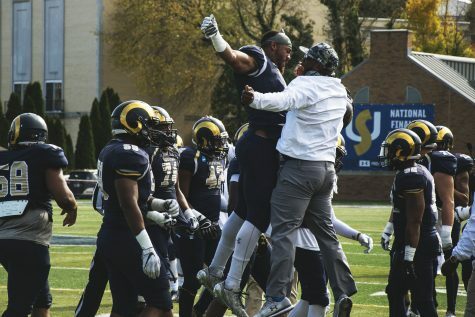 The entire Rams’ bench and fans screamed and hollered with such joy and infectious enthusiasm on a play that capped off a 35-0 second half win for the Rams. On a day that started slow, the Rams’ offense finished with 528 total yards and converted on an impressive rate on third down, going 11 for 15. After a promising start, the Golden Eagles’ offense faltered in the second half. The Golden Eagles registered just 203 total yards, with 153 of those yards being on the ground and just 50 through the air. Senior inside linebacker James Gupton was a big reason why the Golden Eagles’ offense struggled, as he posted 11 total tackles and two tackles for loss. Senior defensive end Myles Humphrey had four total tackles, two tackles for loss, one sack, and one forced fumble. Sophomore cornerback Chris Jones also posted a forced fumble, as ball security was a large issue for the Golden Eagles. Jessop threw his 34th touchdown pass on the season, which is now the most in school history in a single seaosn. Senior kicker Zach Wise also set a new record with his 51st consecutive extra point. After the game, head coach Monte Cater, stressed how important the run-pass balance was in the second half. Jessop was very pleased as well after the game to be able to win at home on Senior Day, clinching the MEC Championship as well. Jessop also said that the team worked on the play that led to Hights’ touchdown in practice this week. Next week, the Rams will aim to finish the regular season with a 10-0 record, as they will travel to UVa-Wise for a noon contest next Saturday, Nov. 12. 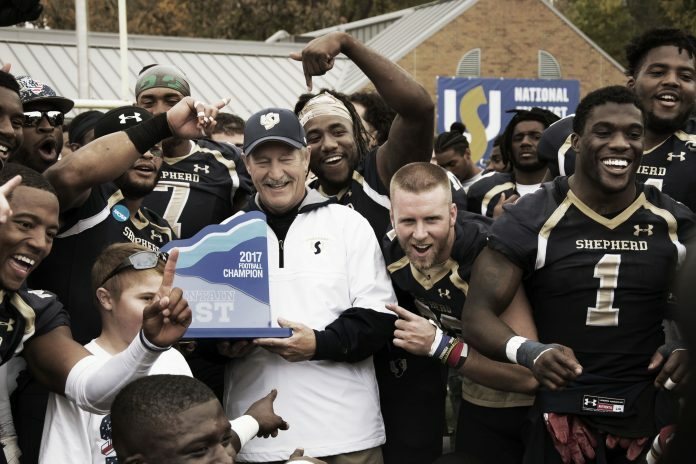 Information from the Shepherd University Athletics’ website was used in this article.